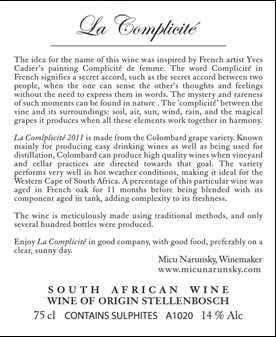 La Complicité, the white wine produced by Micu Narunsky Wines, is made from the Colombard grape variety. Used mainly for the making of fresh, easy drinking white wines as well as for distillation, Colombard can make a very interesting, complex wine when viticulture and winemaking practices are geared towards that goal. 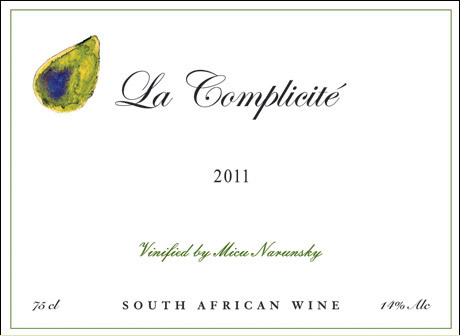 In the case of the La Complicité 2011, grapes were sourced from a prime location in the Stellenbosch area. Meticulous viticultural practices contributed to the production of well balanced, low yielding vines; the grapes of which were harvested at optimum ripeness. In the winery, the wine was made with the utmost attention to detail; a percentage of the wine fermented and aged in French oak, while the other component was made in tank. The two components were blended together after having aged for 11 months, then stabilized and bottled. The resulting wine is complex, while being extremely fresh at the same time. It can be tasted now, but for those who enjoy cellar-ageing white wine, the La Complicité 2011 will evolve nicely in the bottle over the next several years. Only a few hundred bottles of this wine were produced, and it is served at Aubergine restaurant is Cape Town. 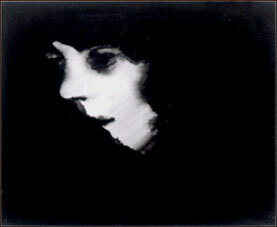 The name for the wine was inspired by French artist Yves Cadier's painting Complicité de femme. The word complicité in French means a secret accord, an understanding, such as that found between two persons who can understand each other without the need to express ideas literally. That 'secret accord' can also be seen in nature, when soil, climate, air and vines collaborate and produce the magical grapes that can then be transformed into wine.